Travel north from Vancouver (on Hwy. 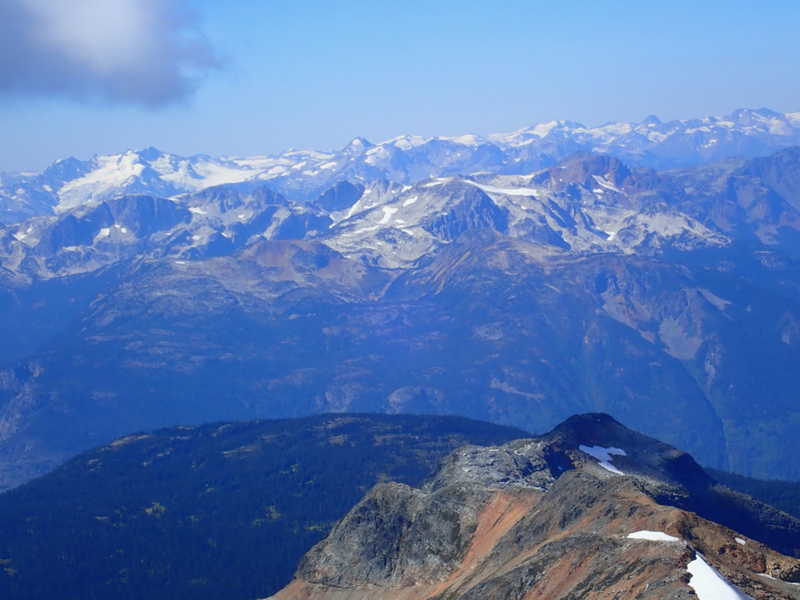 99) towards the well known ski resort of Whistler. Continue on 99 to the small town of Pemberton. From Pemberton, take the smaller road towards D'Arcy. Before D'Arcy, near location N50.52128, W122.50236, fork left. Shortly, make another left fork to access the road that climbs high on Birkenhead, serving some antenna installations. This road is generally good, but a 4WD, in particular, high clearance is needed as the road has a large number of drainage bumps that may be tricky to cross without sufficient clearance. 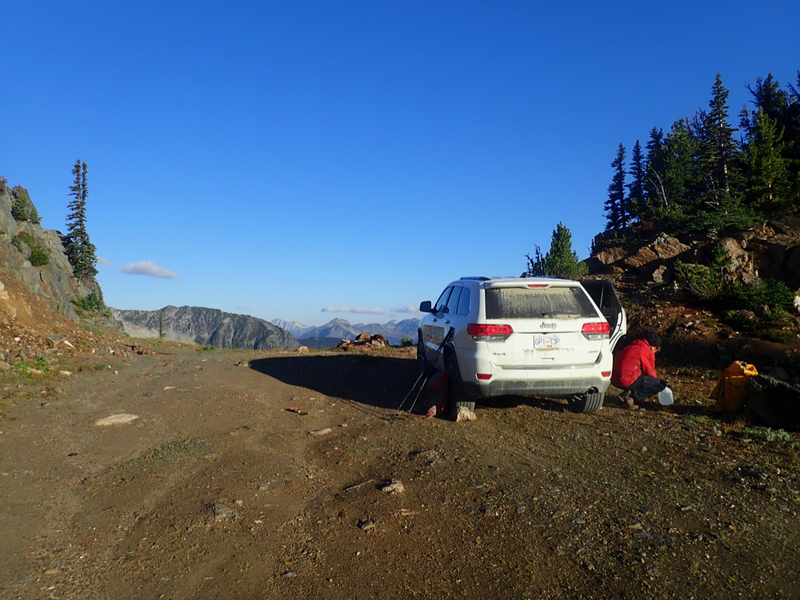 The road climbs significantly in many zig-zags to the antenna facility, one may drive slightly further (rough road) to parking at location N50.52389, W122.58273, elevation near 1900 meter. 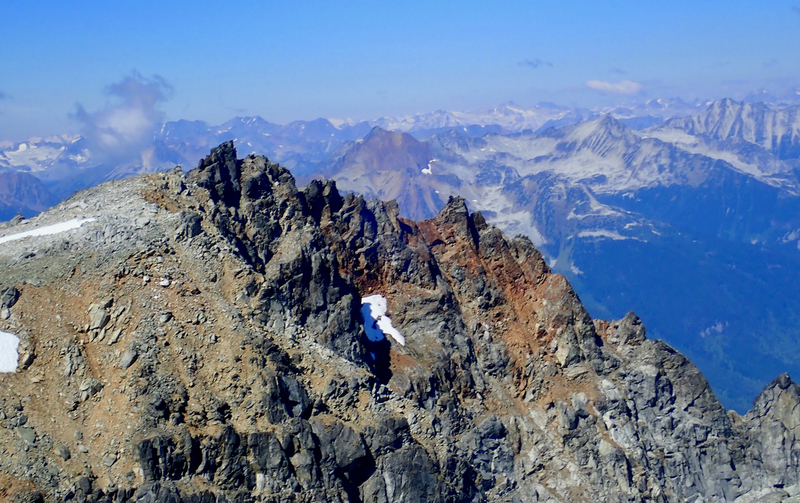 This is quite a nice route, you first climb Kafir Peak, the overall route makes several directional changes as it follows the high ridge connecting Kafir with Birkenhead. 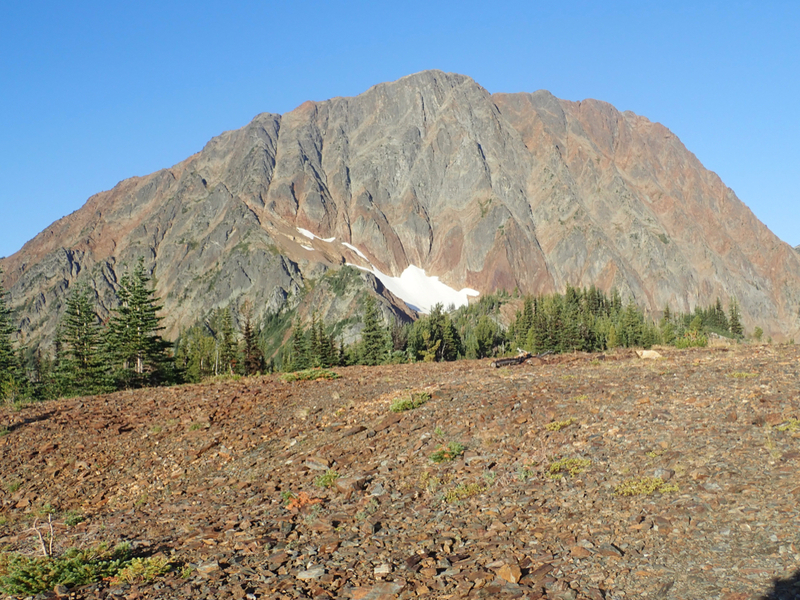 The steep mountain that rises on your east side is called Kafir Peak. The route to Birkenhead Peak first traverses across this mountain. Head up the rough remains of a road, then follow the trail towards Kafir on the connecting ridge. The trail is marked with a few cairns. Closer to the cliffs of Kafir, descend off the ridge to your left and follow the small trail that traverses the steepish slopes on the east side of Kafir Peak. This is the well known Goat Traverse. The trail is actually quite easy to follow, one should be cautious since the terrain below is steep. 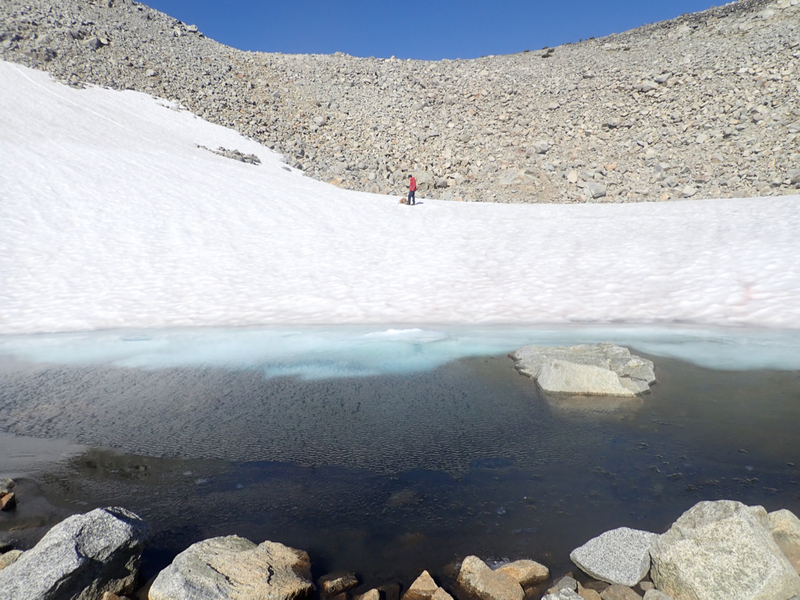 This traverse ends near a big cairn that marks a gully. 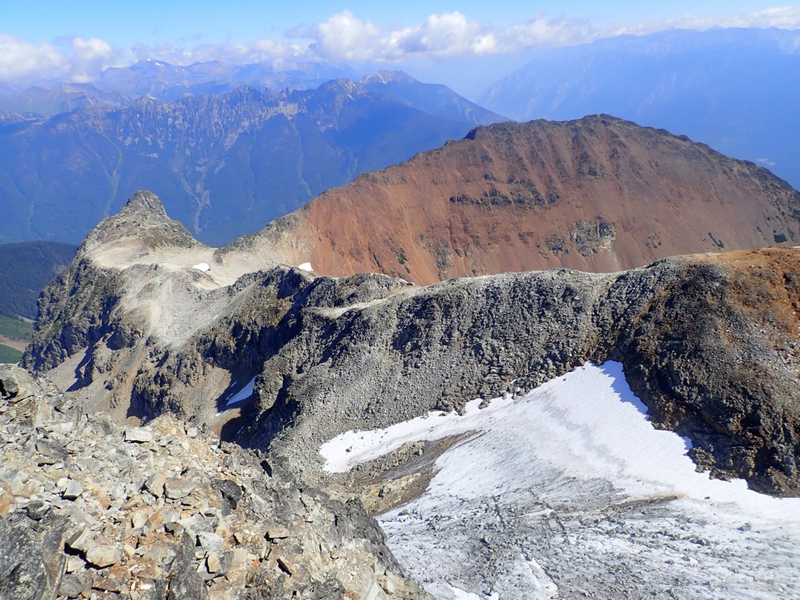 Ascend this gully to reach more gentle terrain, the south ridge of Kafir Peak. Follow the ridge to the Kafir summit. You will now see the summit of Birkenhead. 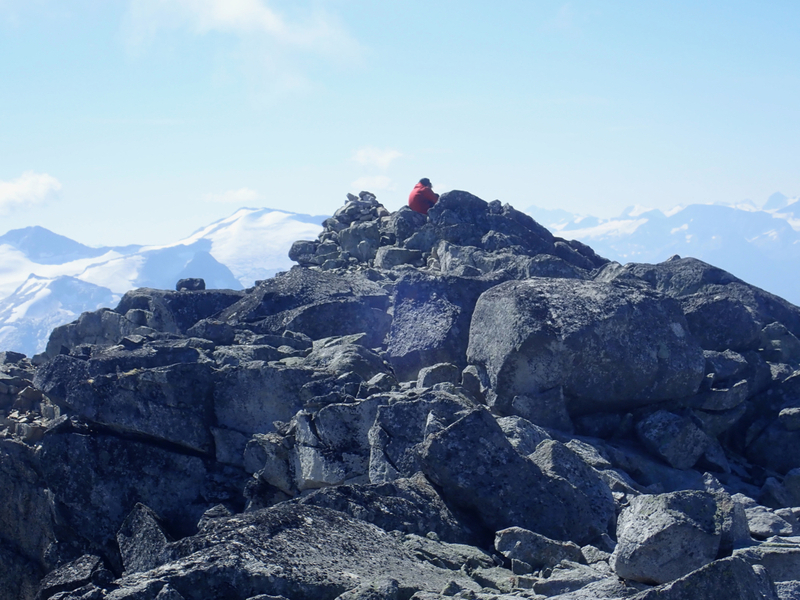 Traverse across three local summit humps of approximately equal height, then descend north-west to the connecting saddle with Birkenhead Peak. The next section of the route follows the north ridge extending in an arc from Birkenhead. 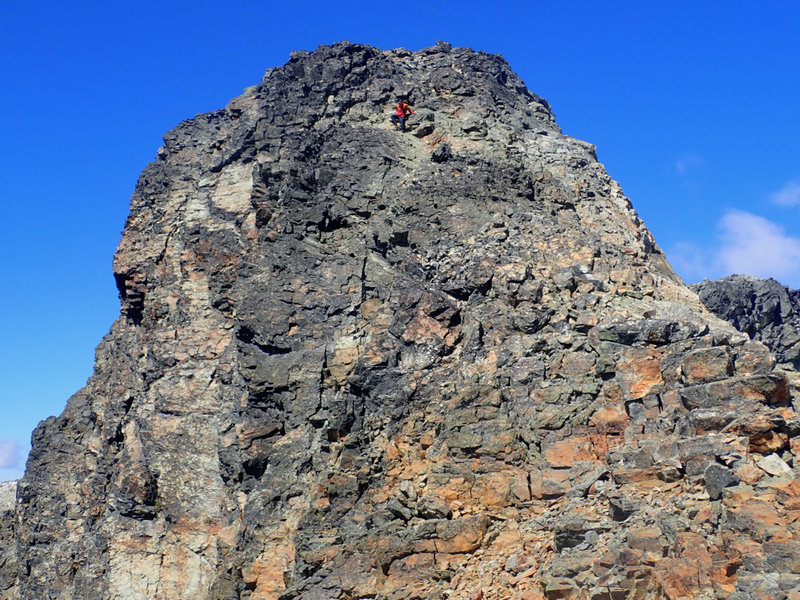 This ridge is generally easy to follow with a few points with (YDS) class 3 scramble. Early on, a short step is most easily circumvented to the right. The best route stays near the top of the ridge. 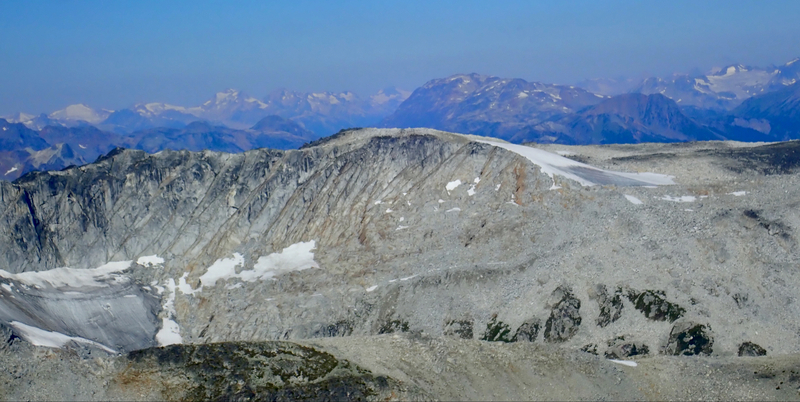 Finally, as the ridge curves right (west) to gain Birkenhead Peak, you climb across a steeper section that may look hard from a distance. However, this small face has an easy route directly up the middle. The remaining part is now only a few steps across a broad connecting ridge. 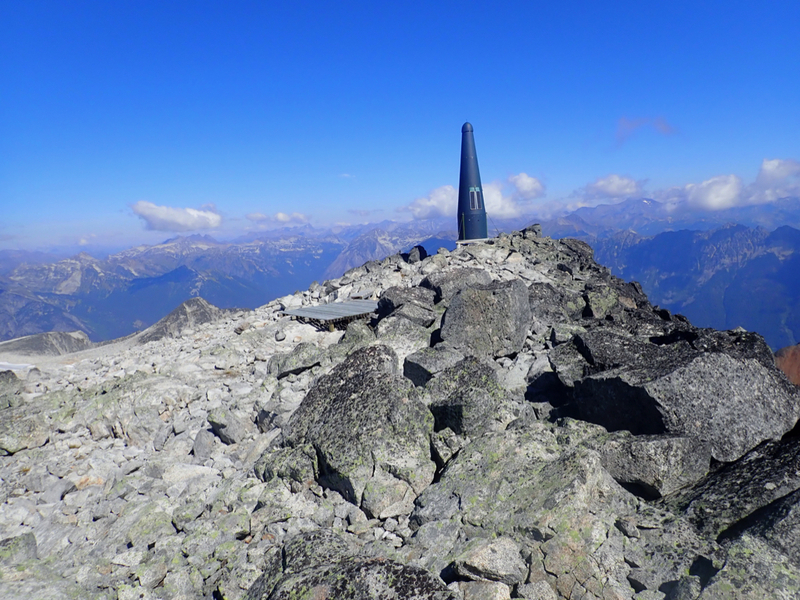 The highest point is located before you get to the antenna station at the end of the ridge. There is also a small wooden platform for helicopter assisted maintenance of the installation. I did this climb with my friend Åke. We drove up the road early morning and were ready to walk by 0745. 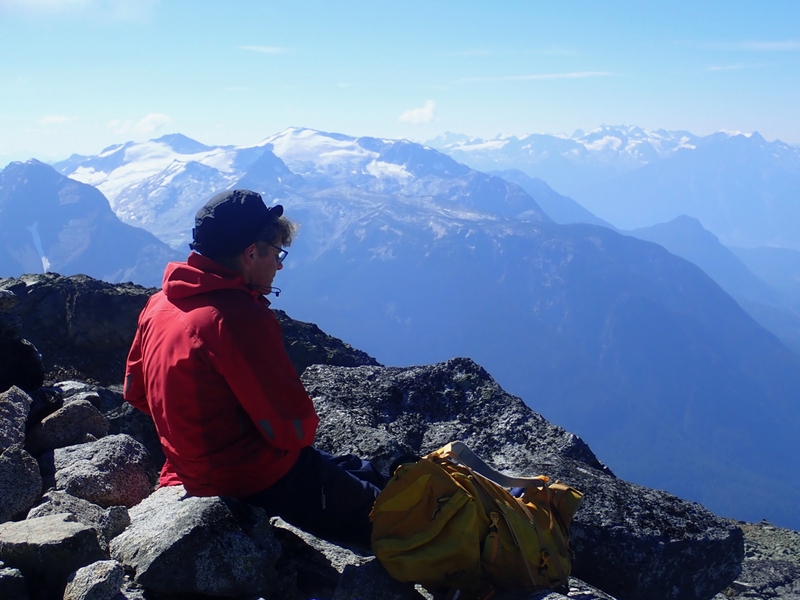 This was a gorgeous day and the hike/climb should turn out to be one of the nicest days we had on this long trip in BC. 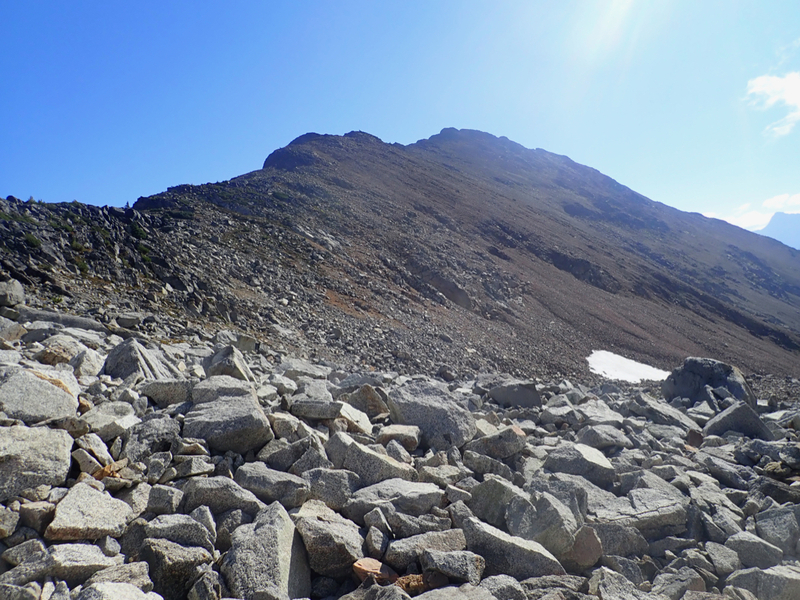 The route was easy to follow and the goat-traverse did not pose any problems. 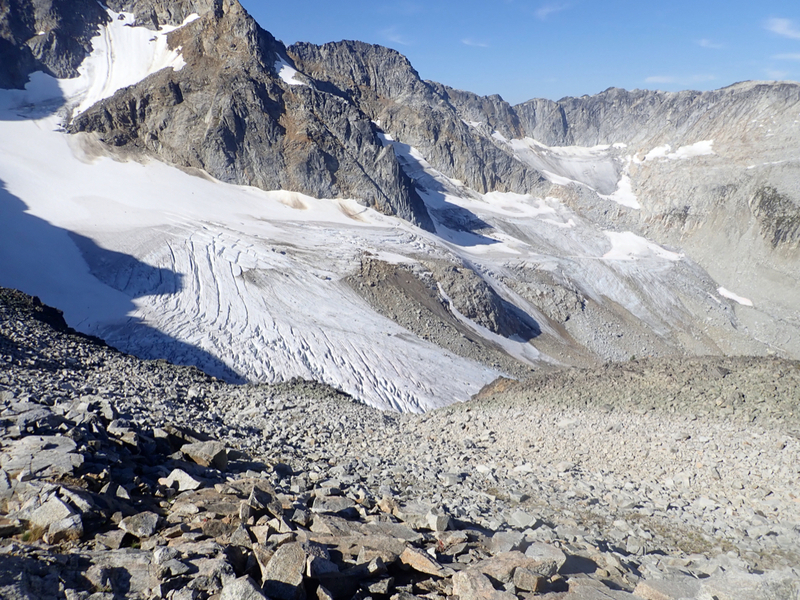 We soon arrived at the base of the scrambly gully, then continued towards the summit of Kafir. This is a bit longer than one thinks. 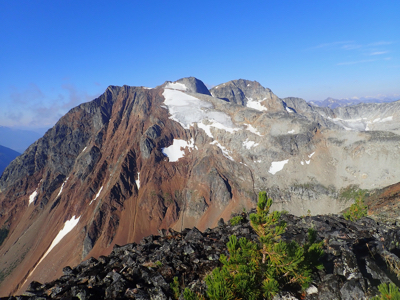 The summit ridge was nice, not entirely clear which top along the ridge being the highest. 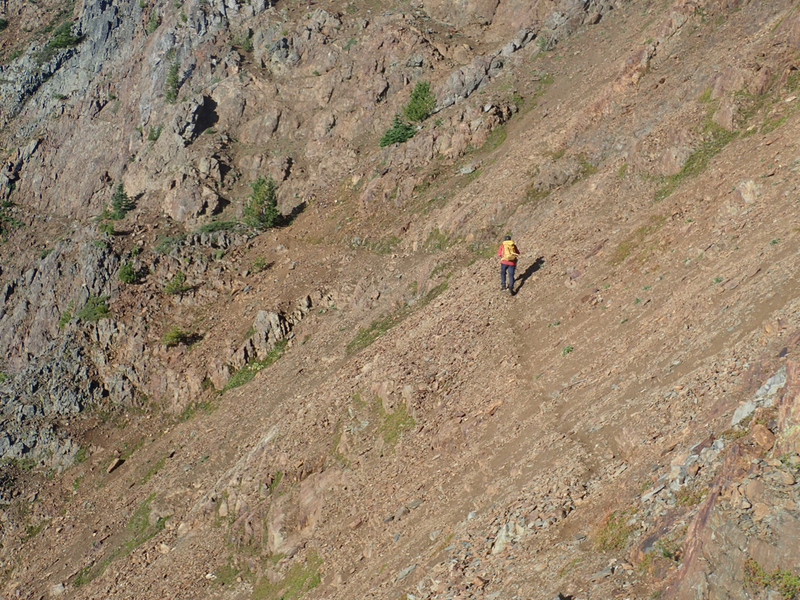 The route traverses this ridge, then descends to the main saddle along the route. We had a good time all along, with a number of brief stops to look around and capture some scenery with pictures. 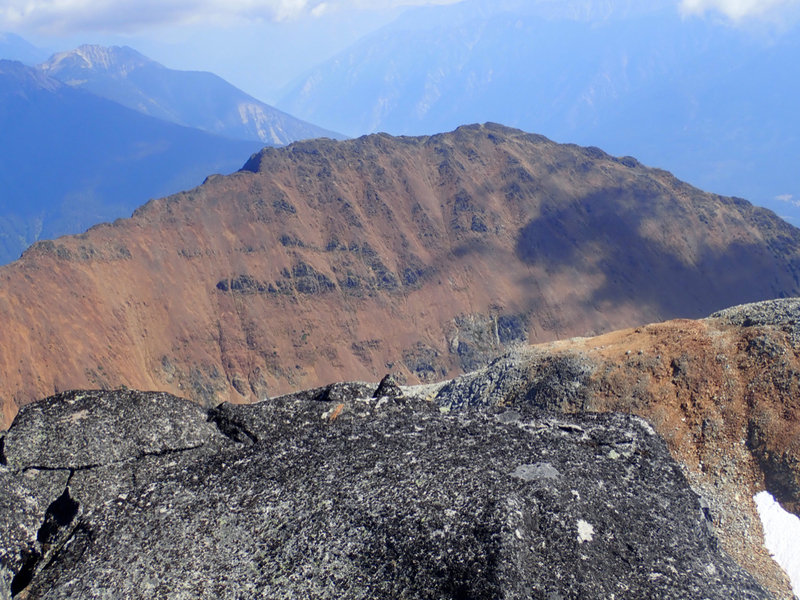 The long, final ridge was equally nice and we arrived at the summit by 1130. We spent half an hour on top, including the short trip from the highest point to the space-looking antenna nearby. 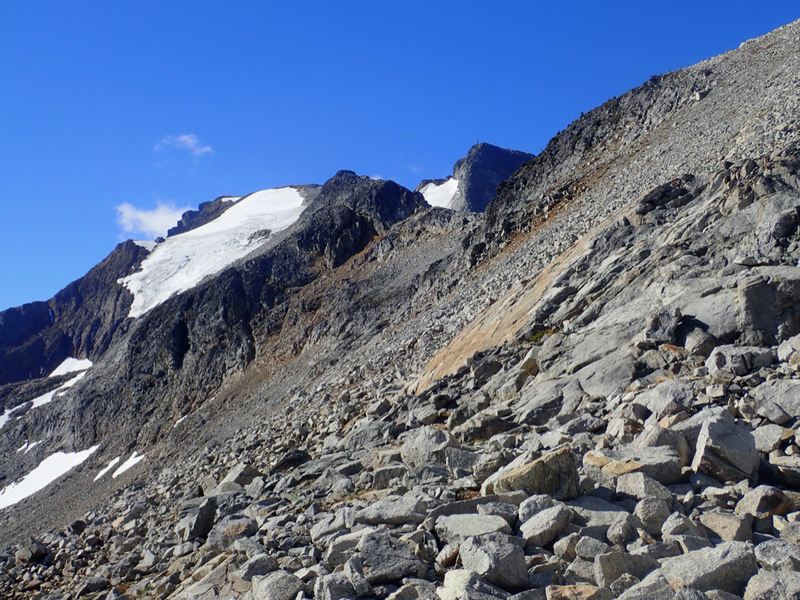 Returning the same way, we were at the car at 1530, a very nice day on our last "single day ascent" in BC. The route as seen from the summit. 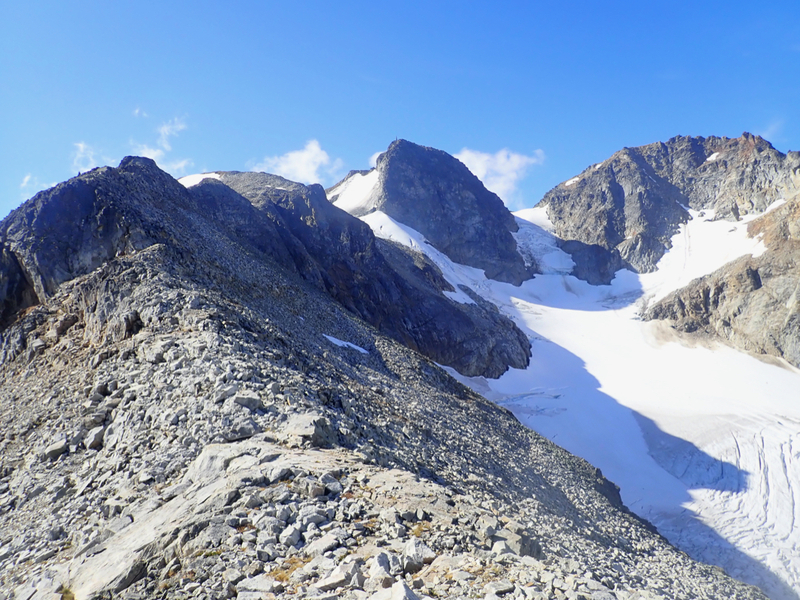 Local terrain, next to our ridge route. Kafir, as seen from the summit.